This is something a little different, leading to something cool: the NW Geology Blog has assembled quite a few self-guided geological fieldtrips, mostly in the Seattle to Vancouver corridor. There are two in the Fraser Valley: the Aldergrove glacial erratic, and the Shasta erratic in Coquitlam. The other BC field trip is to the recent, massive debris flow at Capricorn Creek. But it was one of the Washington State trips which caught my eye though: a trip to a formation of Stilpnomelane at Blanchard Mountain, Skagit County, near Bellingham Washington. The reason this caught my eye: the formation is intersected by massive, green chert beds. Green chert, e.g., just above handle of geological hammer. Source: nwgeology.wordpress.com; Creative Commons licenced. Chert is a silica rich, micro-crystalline rock which can be extremely well-suited for making stone tools. Not all chert is created equal – it can often be brecciated or have internal, blocky fractures. 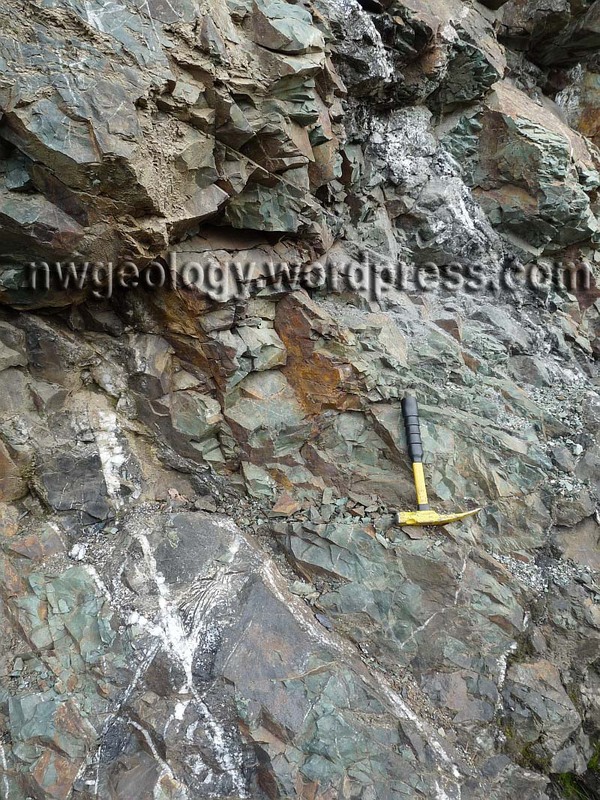 But the chert illustrated in the NW Geology blog seems to occur in quite large beds and nodules, and I would be surprised if there wasn’t useful material in there. As you can see from the view below, it is very close to the ocean, and the mountain must have been well-known and used for a suite of different resources. As it happens, we worked at some sites this summer in the Salish sea where green chert artifacts were not uncommon. As the crow flies, Bellingham is quite close to Portland and Sidney Islands. Green chert is also widely known from elsewhere on the south coast. I have no idea whether or not the Blanchard Mountain source was used, or even usable – it is exposed in a recent road cut – but it might well be worth following up, assuming the Washington State arkies aren’t all over this already. Chert is not that common, especially in larger nodules and beds – which, on Blanchard Mountain, could also be a source for chert found in glacial deposits elsewhere. There is a short technical report on this formation here, also. There has been some recent research demonstrating the ability to chemically fingerprint cherts, which raises the possibility of nailing down a connection between the archaeological record and certain cherts (ref 1, 2-pdf) as is widely down for obsidian. It is also intriguing that Blanchard Mountain is home to greenstone and greywacke and semi-schist, the latter two which may be what is commonly called “slate” in the archaeological record. There is also a major cave system – “almost infinite twisted passageways”. Caves can be attractive to animals and thus to humans, and can also be very stable repositories which preserve archaeological material indefinitely. They are therefore one of the highest-potential geological formations in which to find archaeology from the very early period on the coast, where other landforms see much destructive erosion. This blog post tells you a little about some other rocks and how to get to the caves. Anyway, it is a nice blog and the author, Dave Tucker, is also writing a book which, if his well-written posts are anything to go by, should be well worth having. Map of Blanchard Mountain, Bellingham to uppermost left. Source: Friends of Blanchard Mountain. This entry was posted in Archaeology, Northwest Coast, Technology, Washington State and tagged Bellingham, Blanchard Mountain, chert, geology, lithics, Salish, Salish Sea. Bookmark the permalink. The talus of huge blocks that contain the Bat Caves is quickly reached. These fell from the 200-foot-high west face of the Oyster Dome, towering above you. Let’s discuss the rock of Oyster Dome on top. However, you may want to grab a little piece to contemplate once you are up there- try to get a freshly broken surface. Did these house-sized talus blocks accumulate one by one, or did the west face collapse all at once? What would cause that? A big earthquake? We don’t know. In any case, if the rock isn’t too slimey, it is possible to go down under some of the talus blocks, but only do so if you have a hardhat and two flashlights. The caves are very contorted, with an infinite number of branches. It is possible to crawl for hundreds of yards, but it is wet, muddy, and very constricted. The caves are home to rare bat species; if you see any bats, steer clear. Two, recreational cavers have spread “White Nose Syndrome”, an extremely serious fungal disease which is decimating bat populations in eastern North America after being introduced from Europe. Caves should probably be considered completely off limits to recreational caving now, and only those with serious scientific purpose and demonstrably sterile equipment, should be allowed in. I’d hate to see some of the globetrotting NW cavers bring this disease to our neck of the woods. I’ve heard enough horror stories, many of them recent, of cavers digging their way through bone-bearing cave sediments with picks and shovels in order to achieve little more than the satisfaction of their curiosity by getting into the next chamber. I’d be in favour of a moratorium on recreational caving in this province, and of the establishment of a permit system to enter caves. In any case, I’d urge people on both archaeological and disease-prevention grounds not to go tooling around in these caves. Agreed on the caution around bats, and some control around sensitive ecosystems such as select caves. I’m not so keen on the idea of blocking access to public lands with the idea that there ‘could’ be (fill in the blank) of significance. I would rather that there be the appropriate investigations first before declaring lands out of bounds. Education, not regulation, has always proven most effective especially in backcountry situations. Now back to shootin’ dem gophers. Thanks for the link to my Northwest Geology Field Trips website in your ‘chert’ article. I don’t know if the Blanchard Mountain chert was used by natives. It is a very localized exposure, only extending a hundred feet or so, and none has been found elsewhere on the mountain. It is difficult to get a piece of this chert more than a few inches across, as it is pervasively fractured; consequently anything made from it would be small. Everything exposed there now is the result of logging road blasting, and the road itself runs along the foot of the outcrop. Likely anything of archaeological interest that may have been there at one time is destroyed. The Bat Caves on Blanchard Mountain may have been used by Native Americans, but they have been thoroughly used over the years by many hundreds if not thousands of hikers. Furthermore, they may not be very old. There is some (idle) speculation that the rock fall that formed them resulted from the last magnitude earthquake around here, the night of January 26th 1700. I do know of a small, genuine limestone cave in the region, but will not post an article about it, at least not at this time, out of concern for vandalism. I was just adding a different comment, and here you are – thanks for stopping by. I really enjoyed looking through your web site. Thanks for the additional info on the chert and the caves All too often I have seen chert nodules which break up into little dice-like cubes. I suppose we’d be looking for ones minimum size about a coffee mug, to be worthwhile (though microblade cores could be much smaller). I think the size of the exposure is a bit moot — over the years, First Nations pretty much got everywhere, and, correct me if I am wrong, this particular formation could come to the surface elsewhere, nearby perhaps? Also thanks for the cave information. Boulder-style rockshelters were very widely used as burial caves on the Northwest Coast, including some quite far inland and well into the historic period, so I wouldn’t rule it out for archaeology of that kind either, even if it was from AD 1700. And good for you for keeping the limestone cave secret. It is so easy for caves to get loved to death by well-meaning but destructive enthusiasts. It sounds like a fascinating mountain — I wonder if all mountains have so much geological interest or if this is a particularly heterogeneous example? I’m unaware of any other chert exposed on Blanchard; the geology is mapped in good detail. This exposure is pretty anomalous and probably faulted into place. In my book, any mountain has at least something interesting geologically. Blanchard has a nice variety of rocks, so is all the more intriguing. This one is close to Bellingham, and particularly well known to me, so I wrote up this field trip. Over time, I will write other trail side geology field trips. I’d encourage you to visit the chert exposure to see for yourself if the rock would be adequate for tool making. It is not far off I-5, south of Bellingham. Full directions on the Blanchard Mountain geology field trip page. Hi remi, yeah you’re probably right, we’ll catch more flies with honey, etc. I’ve just had some bad experiences with sanctimonious and hypocritical cavers though, and it does seem they are the most likely vectors of the disease, as contaminated cave sediments move from cave to cave in boots, cave suits, on gear, etc. (otherwise, internally stable caves don’t see much sediment movement from one to another). And a lot is at stake — think Dutch elm disease, for bats – it is devastating, commonly wiping out entire colonies, and it strikes multiple species. I note they say most common method of transmission is “bat to bat” which (a) doesn’t explain how the disease spread from Europe to America and (b) could be true, and yet irrelevant – if 99% of the spread is bat to bat WITHIN a colony, it is nonetheless that 1% which is spread via humans BETWEEN colonies that is the most important in keeping the infectious vector alive. Anyway, precautionary principle is, shut down all caving until we know for sure and can control this disease; which may involved extraordinary precautions when using equipment in more than one cave and/or single-cave equipment purchases (e.g., tyvek). No one’s hobby is worth the extinction of a species. So maybe I don’t agree with you after all! Hehe – I wasn’t advocating the annihilation of a species ! I agree that controls need to be put in place for those caves that contain bats. We only need to look at BC’s hotsprings for an example of microsystems that have been devastated through overzealous use. Secrecy provides protection, as does difficulty of access (just like archaeological sites I suppose). Within the caving community these concerns are hot topics, and I suspect most cavers are sensitive to the issues. The greater issue is the general public – the ‘week-end warriors’ – who do not take the time to consider the ramifications of their seemingly benign actions. The caves in Banff are a good example of this, and I wonder what Parks Canada is doing in that respect. Just a note to say, I see the magmatist’s book on Western Washington State Geology is out and he is doing a series of readings. Could be worth checking out!